The theme of this website itself is completely renewed for visitors with iPhone or iPod touch. With the plugin xilitheme-select, site’s server detects your mobile or pad and delivers high quality pages (with a design related with this of xiliphone.mobi) by adding also text direction of right to left languages. (The theme is also compatible with xili-language). 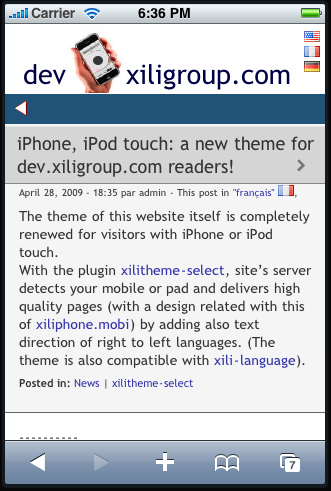 Ce contenu a été publié dans News, xilitheme-select, avec comme mot(s)-clé(s) iphone, ipod touch, text direction, theme, wordpress. Vous pouvez le mettre en favoris avec ce permalien.